In response to Ozzie Osbourne’s claim that illegal downloads are ruining his career, fellow crinkly rocker, Alice Cooper suggests that it was The Osbourne’s tv reality show that ruined Ozzie’s career. 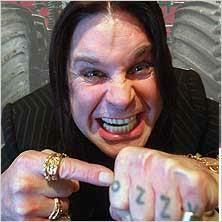 Saying that the series left the fans disappointed, after letting them into his home Osbourne ruined the mystery surrounding him and made himself a laughing stock. “Most fans thought he lived in a big dark castle with skeletons in the cellar” said Cooper, adding that as a close friend of Osbourne’s he was saddened that the audience was laughing at Osbourne at not with him. While Ozzie’s career may be ruined, sadly wife Sharon has made the most of things. Old rocker Ozzie Osbourne has revealed to Australia’s Herald Sun, that he is “suffering terribly” from the effects of illegal downloading. Sales of Ozzie’s latest album Black Rainhave been slow due to web piracy according to the brummie artist. The report in the Rolling Stone magazine suggests, as i am inclined to, that the album may not be very good. The good news for Ozzie fans, but bad news for Osbourne himself, is that he is being forced to do ninety concerts a year to promote the album.